I am always interested in learning about the artisan that I am buying from so I read through his website with interest. I spent some time on the page where he wrote about his carving and his life. The part where he wrote about the connection to his granddad and his carving was fascinating to me. It seemed like he was truly continuing the family tradition. I have included his words and a picture of the two of them from his site below to give you an idea of the carver. The picture below is one I copied from Twitter. 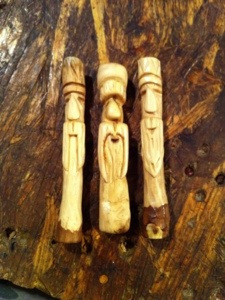 It shows some of the tampers that he has carved – his daughter calls them the moustache men. There is a rustic and interesting quality to each of them that makes them unique. My tamper arrived yesterday and I have to say Cody packs a great package. 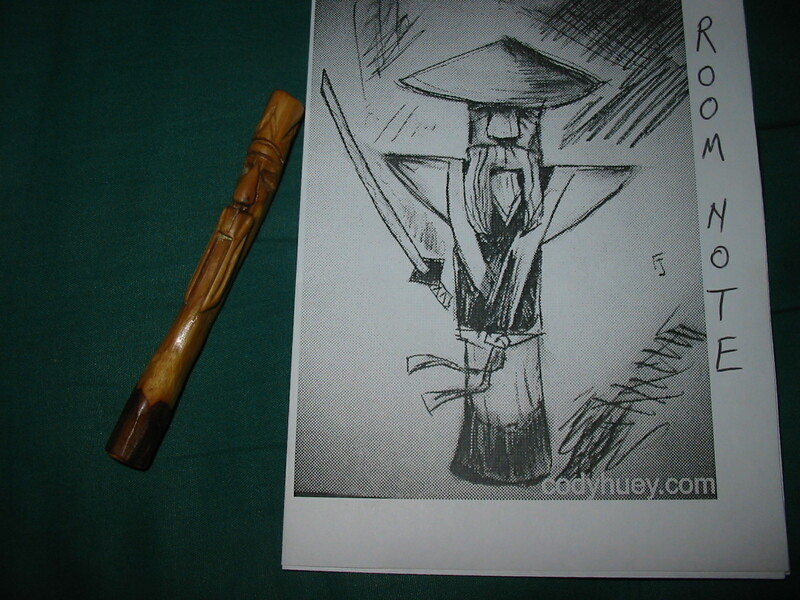 He included a note card with a sketch of a Samurai tamper! It is very unique looking. He also included a handful of Werther’s Original Coffee flavoured toffees. He had no idea that those are one of my favourites. I then removed the well wrapped tamper to see which one he had sent me. I peeled off the wrapping and it revealed that he had sent the tamper on the far right in the above photo. I could not be happier with my tamper. It fits well in my hand. The wood is gently curved with a slight notch below the moustache that fits perfectly against my finger when I holding it to tamp my pipe. 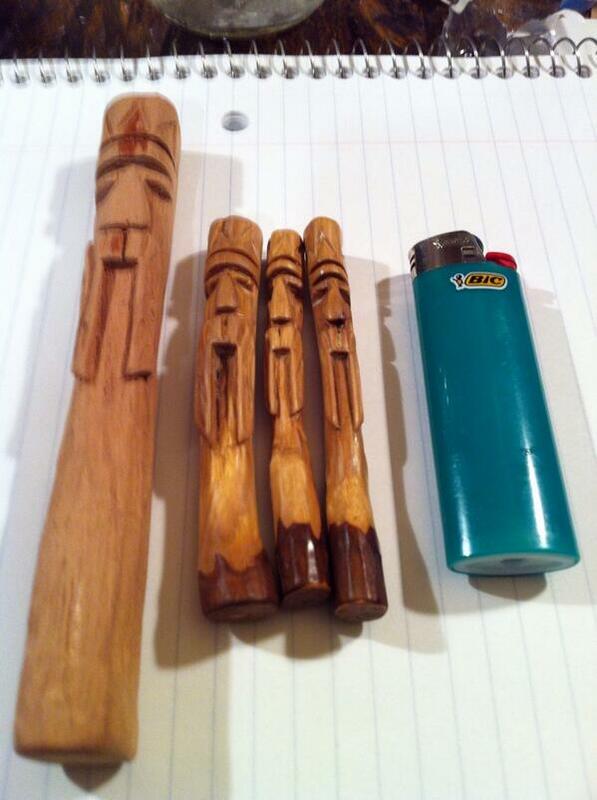 The carving is well executed and is kind Cody’s take on Tiki carvings. 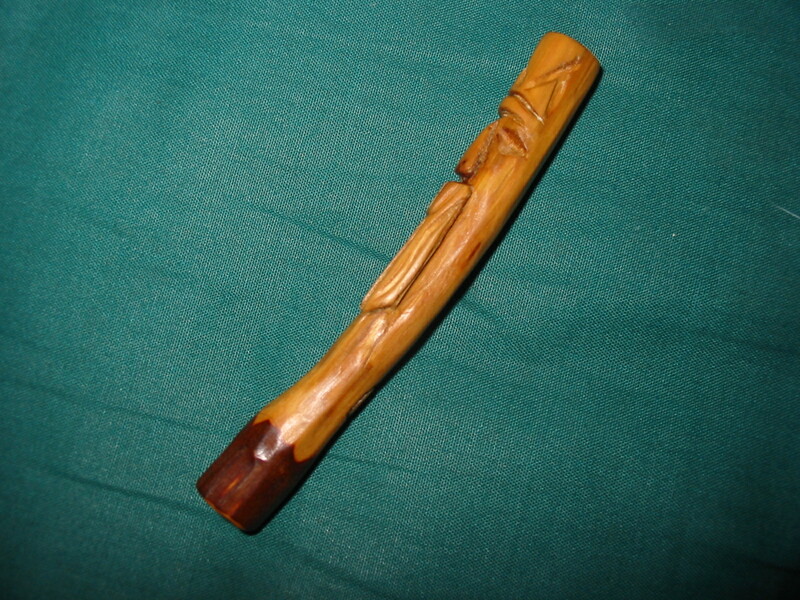 The tamper is cleaned of the bark and then carved. 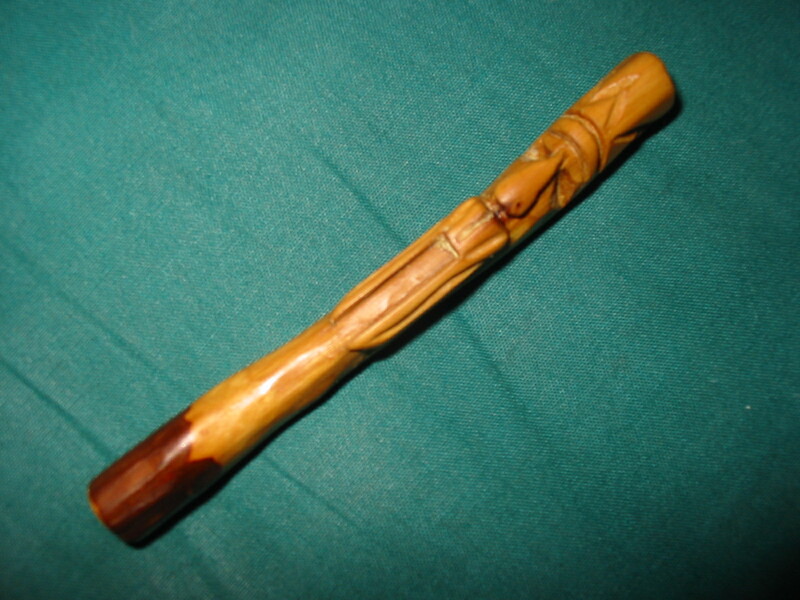 The majority of the tamper is the clean yellowish wood that has been smoothed after carving. Cody left the layer under the bark on the last ¾ inches or so of the tamper at the bottom edge. It thus has the dark colour in the area that will spend its time in the bowl of my pipe. I think this is an ingenious idea as on my other wooden tampers this part darkens quickly due to the ash and tars of the burning tobacco. Those who read this review have a look at Cody’s site and join me in enjoying these uniquely carved tampers. I know that you will not be disappointed. Thank you Cody for a well made tamper with individualized and unique carving, nicely done! Your craftsmanship is evident in the finished product. Thank you for the nicely done finish on the piece and the well packed shipping. It came promptly through the mails without any problems. The card and the candies was a nice touch. I will enjoy this tamper for a long time to come. Glad to have been your first international order. This entry was posted in Pipe Related Essays and tagged artisan carved tampers, Cody Huey Tampers, Moustache men tampers, pecan wood tampers, pipe accessoris, Tiki Tampers on November 22, 2013 by rebornpipes. Those are some unique tampers! What a lovely tamper and so good to read some skills are passed down. Thank you. 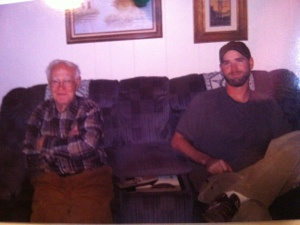 I take great pride in continuing my Papa’s tradition. GREAT REVIEW. I went to Cody’s web site…..very well done. I learned how to make sauerkraut, and must order a tamper soon. Thanks. Dave that sauerkraut is some good stuff. Alright! Just ordered my moustache man tamper. Do any come with a full beard? I did not ask… email him from the site and see what he can do. Mark thanks for your support. Hope your tamper gives you many years of satisfaction. My bearded tamper sits with pride on a little play doh base to hold him upright. Probably will never use him, except as part of my tobacciana collection. Love it! Great review! Gonna have to check out his website to place an order, I don’t do the twitter thing! You don’t need twitter to do it. Just click on his site. I am so glad you like it. Thank you very much for the outstanding review. Excellent post!!!!! I have one of Cody’s tampers, too, and love it! He’s a great guy; he sent my son some material encouraging him to keep carving after a bad cut on his thumb. I really enjoyed reading about how Cody was continuing his grandfather’s art, too. He is also a YouTube pipe community member and shares a lot of neat stuff there as well as on his website. How’s your sons carving coming along??? I would love to see some pics. And I’d love to show some … but he’s still “knife shy” and hasn’t done any since the bad cut last Christmas. He’ll get there. It will just take some time. I hope so. I told him just the other day that folks had/were asking about his work so maybe this’ll kindle him up a bit.